Flavored butters are a great way to season a variety of foods. They are simple to make and taste much better than store bought. You can make them sweet, or savory, and store them for two weeks in your refrigerator. Flavored butters can also be frozen and then thawed when needed. Here are some easy and delicious recipes, that make five flavored butters. 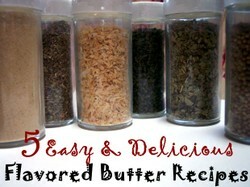 The type of butter you use in recipes, can make a difference in how flavorful your finished product will be. By buying high quality butter, you will get better results in cooking and baking. You will be able to taste and see, the difference it makes. Here are some top-rated brands, that are perfect for flavored butter recipes. Honey Cinnamon butter, is a great companion to many types of bread. Whether you use it on warm rolls, toast, biscuits, or yeast breads, it is sure to please! Mix all ingredients with a hand or standing mixer. Place butter in a sealed container and date it. Keep in the refrigerator for two weeks or the freezer for four months. Mix all ingredients in a food processor, with a mixer, or by hand. Put butter into a sealed container and write down the date. It will keep in the refrigerator for two weeks, or in the freezer for up to four months. Strawberry butter, is a wonderful delight on croissants, pancakes, waffles, and more. Enjoy this butter with a variety of pastries and breakfast foods. Blend all ingredients with a mixer and put in a sealed container. It will keep for two weeks in the refrigerator, and four months in the freezer. Herb butter, is a great blend of garlic, herbs, and two types of pepper. It goes well with shrimp, chicken, steak, vegetables, and more. This is a great butter to have at gatherings and cook outs. Mix all ingredients in a food processor, or with a mixer. Place butter in a sealed container. Store in the refrigerator for two weeks, or in the freezer, for up to four months. Cranberry orange butter, is a great butter for a variety breads, muffins, and desserts. Mix all ingredients in a food processor or mixer. Place in a sealed container. Keep in the refrigerator for one week, or in the freezer for up to four months. 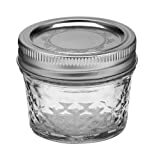 You can choose from a variety of containers to keep your flavored butter in. Check out the examples below. Would You Make These Flavored Butters? I tried to make garlic butter few years ago and it was a disaster. Now you almost convinced me to try something similar again... Thanks for recipes. Cranberries and orange zest sound like great start of experiment! I agree that the flavour of butter can alter the taste of recipes. The dishes that come out with high quality butter can be mighty tasty. Yes, all natural is always better for you and taste amazing. Great butter recipes. I've made the cinnamon, sugar and butter before for putting on toast but never added honey. I'll have to give it a try along with the rest. I love real butter it makes any dish so much better as I'm sure these flavored butters will more so. The honey and cinnamon butter sounds amazing. The ingredients are now on my shopping list. Thank you!